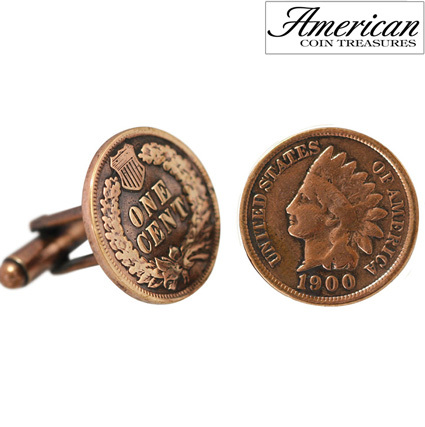 Let your French cuffs become a topic of historical conversation by wearing genuine copper Indian Head Cent cuff links! Over 100 years old, the Indian Head cent was minted from 1859 to 1909! The 95 percent copper penny was designed by James B. Longacre and titled Liberty with head dress. One cuff link displays the obverse featuring the words United States of America encircling Liberty wearing a feather head dress. The other cuff link displays the reverse featuring a wreath and shield encircling the words One Cent. The copper Indian Head cent cuff links are 19.05mm in diameter and have a bullet style closure.